Three bridges built in three different centuries, the iconic Forth bridges are must-see sites in Scotland. Queensferry Crossing – to the west, the Queensferry Crossing is due to open in 2017, becoming the Firth of Forth’s newest road bridge. Forth Road Bridge – in the middle, the Forth Road Bridge was opened in 1964 and stretches 2.5 km. It’s the only one of the three you can walk across. Forth Bridge – to the east, the famous Forth Bridge was opened in 1890. As well as being a working rail bridge it’s also a UNESCO World Heritage Site. Located on the south side of the Firth of Forth, between the Queensferry Crossing and the Forth Road Bridge, Port Edgar Marina is an ideal spot for getting an up-close view of the brand new bridge. Other things to do: enjoy a bite to eat in the café, try watersports, including canoeing, sailing and stand up paddleboarding, with Port Edgar Watersports CIC or bring your bike and race along the Vat Run mountain bike track next to the marina. Queensferry, or South Queensferry as it’s commonly referred to, is a pretty town on the southern shores of the Firth of Forth. Its waterfront area at Hawes Pier is nestled right beside the stunning Forth Bridge and offers great views of this iconic structure. Other things to do: stroll along the waterfront and enjoy an ice cream, visit Queensferry Museum to learn about the building of the bridges or take a walk or cycle along part of the John Muir Way (which passes under all three bridges), either west towards Port Edgar, or east through the Dalmeny Estate towards Cramond. North Queensferry lies across the water from South Queensferry, on the northern bank of the firth. This splendid view of the Forth Bridge is taken from the North Queensferry Light Tower, the world’s smallest working light tower. Other things to do: visit Deep Sea World to see the fish or walk or cycle along the Fife Coastal Path, heading west toward Charlestown or east towards Carlingnose Point and Dalgety Bay. Close by you could also visit Dunfermline with its beautiful abbey, or Culross with its ochre coloured palace. As well as being the only bridge you can walk or cycle across, the Forth Road Bridge is also perfectly placed for snapping beautiful photos of both the Queensferry Crossing and the Forth Bridge as it is located right between the two. The east side foot/cycle path (which looks directly across to the Forth Bridge) is open all year round while the west side foot/cycle path (which looks directly across to the Queensferry Crossing) is open on Saturdays year round and also on Sundays during the winter months. See more info on walking across the Forth Road Bridge. Train views don’t get much more splendid than this. Book your tickets for an unforgettable train ride across the iconic Forth Bridge. The views are glorious in either direction. To the west you’ll see the Forth Road Bridge and Queensferry Crossing while to the east lies the Firth of Forth islands. Dalmeny train station (for South Queensferry) and North Queensferry train station are the closest stations to the Forth Bridge, with services to both running regularly from Edinburgh Waverley and Fife. See info on getting to the bridges. From travelling over the bridges to travelling under them, gaze in wonder as each of the three Forth bridges tower above you on a boat trip. With boat tour providers such as Maid of the Forth and Forth Boat Tours you can choose from various sightseeing tours that will take you right under all three bridges and out to Inchcolm Island. Tours depart from Hawes Pier in South Queensferry (and occasionally Port Edgar) and you have the option to add on a visit to Inchcolm Island. Located by Linlithgow, on the southern banks of the Firth of Forth, Blackness Castle was built in the 15th century and is said to look like a ‘ship that never sailed’. Climb to the top of its towers and sweeping curtain wall for open views east to the Forth bridges. Other things to do: explore the castle and enjoy a walk along the coast on section 6 of John Muir Way. Close by you could also take a steam train ride on the Bo’ness & Kinneil Railway, visit elegant Linlithgow Palace, enjoy a cream tea at Hopetoun House and see family heirlooms at House of the Binns. Just along the firth from Blackness Castle (15 minutes’ drive or 1 hour 5 minutes’ walk) stands beautiful Hopetoun House, one of Scotland’s finest stately homes. Look out for views of the bridges on your tour and stop off at the tearoom for a delicious bite to eat. Other things to do: enjoy a walk along section 6 of John Muir Way which passes through Hopetoun Estate or visit Hopetoun Farm Shop to pick up tasty treats. Close by you could also tour the historic House of the Binns, visit imposing Blackness Castle, take a steam train ride on the Bo’ness & Kinneil Railway or visit elegant Linlithgow Palace. 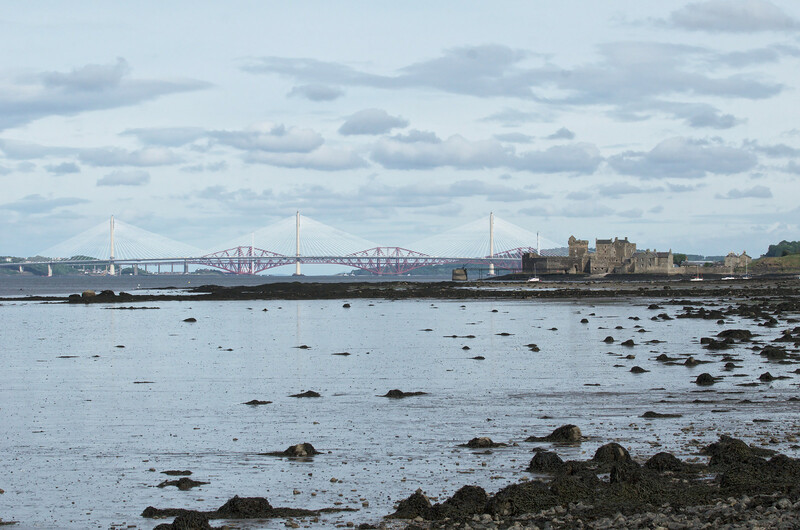 The beautiful shore walk through Dalmeny Estate (on section 7 of John Muir Way) offers plenty of great views of the Forth bridges, as well as the islands of the Firth of Forth and across to Fife. Perfect for walking or cycling, the 4.5 mile route starts in South Queensferry, at Hawes Pier, and travels around the shoreline at Dalmeny Estate to the historic village of Cramond. Other things to do: tour Dalmeny House (check opening times) to see beautiful works of art and precious objects, enjoy an ice cream at Cramond beach or walk out to Cramond island when the tide is out. And finally … your bonus viewpoint! Keep your eyes peeled when taking off from or landing at Edinburgh Airport and you could be treated to a bird’s eye view of the bridges from above. Wow! See info on getting to the bridges and plan your visit now or read our blog on 12 iconic Scottish bridges for more great bridges throughout Scotland.